Wind and solar electricity generation in 2017 provided at least 20% of total generation in 10 states, according to new figures published by the US Government’s Energy Information Administration (EIA). 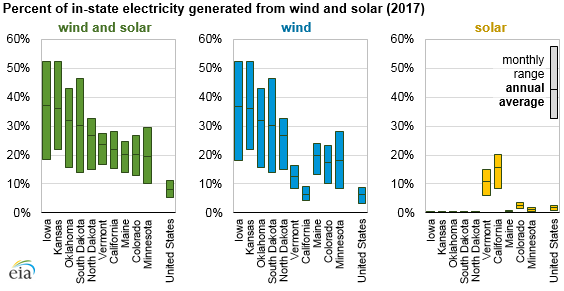 According to the EIA, wind and solar generation — which includes small-scale solar PV — reached or exceeded 20% of total generation in a total of 10 US states in 2017 — Iowa, Kansas, Oklahoma, South Dakota, North Dakota, Vermont, California, Maine, Colorado, and Minnesota. Interestingly, of these 10 states with the highest shares of wind and solar generation, almost all of them are driven by wind energy generation (as seen below). For example, Iowa boasts annual wind and solar generation of 37% — but this is made up of 36.8% wind generation and only 0.2% solar. The American Wind Energy Association (AWEA) published similar stats earlier this year, which showed that wind energy is responsible for over 30% of the electricity generation in Iowa, Kansas, Oklahoma, and South Dakota. Further, wind energy generated over 10% in 14 states and accounted for 6.3% of US electricity in 2017. Conversely, some states — California from the top 10, and Nevada, Massachusetts, and Arizona from outside — generate more from solar than from wind. California, for example, generates 15.6% of its electricity from solar and 6.4% from wind. What’s even more impressive, however, is that in some months during 2017, wind alone accounted for more than 50% of in-state electricity generation in both Iowa and Kansas, while solar accounted for over 20% in California. Overall, total annual generation from wind and solar in the United States last year reached 8%, peaking at 11% in April.